Editors Note: Try Ax Chow for an improved version of this recipe. Of all the People Chow recipes I've developed this is by FAR the best! It's got a smooth, velvety texture, a very mild flavor with a hint of tortilla chips, and every time I finish a glass I want more! I think we've finally nailed this recipe and I want to thank the community for all their valuable input in making People Chow 3.x so darn awesome! Also: Check out that daily cost! Be sure to sign-up to be notified of changes to People Chow! Nearly all ingredients sourced from Amazon. Can be 100% sourced from Amazon. Although already fairly inexpensive, cheaper ingredients can be found if you're willing to shop around. CHANGELOG 3.0.1 - "Tortilla Perfection!" CHANGELOG 3.0.0 - "Tortilla Perfection!" Turns out methionine and cysteine should be used directly for the sulfur requirement, as it is sulfur-containing amino acids (SAAs) that are necessary, and not elemental sulfur. CHANGELOG 2.3.0RC1 - "Name Pending!" CHANGELOG 2.2.2 - "Make your farts sparkle!" Cheekier tagline. Open to suggestions. CHANGELOG 2.2.1 - "Now with reasonable Niacin!" Added sulfur calculation from L-Methionine and L-Cysteine to the Whey Protein Isolate and almond meal. According to Sintax at http://discourse.soylent.me/t/sulfur-in-cysteine-and-methionine/10626/5?u=maxk we're looking at 0.21 x mass of methionine + 0.2666... x mass of cysteine to calculate sulfur available from these ingredients. Removed MSM to compensate for added sulfur from the previous change. One can only presume the lower sulfur will result in a person's farts being less unpleasant. CHANGELOG 2.2.0 - "Now with reasonable Niacin!" Reduced niacin to < 35g. This was probably unnecessary, but had the pleasant effect of making all the fields go green. Also, it's slightly cheaper. Removed the coconut flour There was an error in the masa fiber totals. After correcting the error, the total fiber was quite high and supplementation in the form of coconut flour was no longer necessary. "What happened to the Hypothetical Q & A?" The notes have been getting far too long and it's time to move this information to a more organized venue. 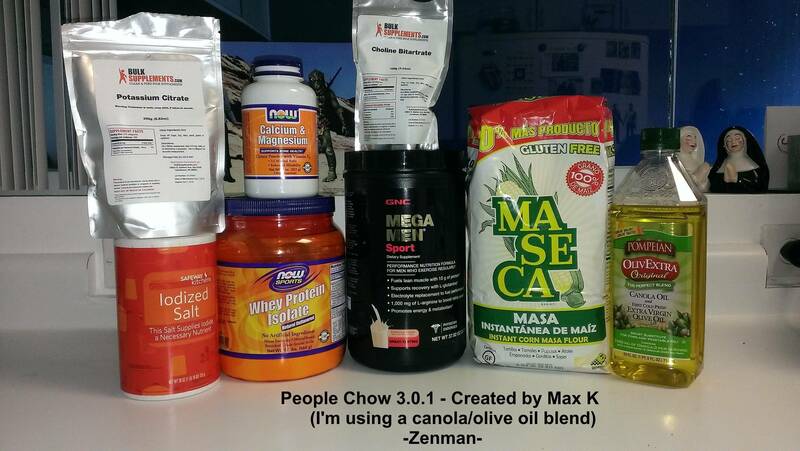 So I present to you: The People Chow Blog! Please refer to the FAQ there before posting questions! 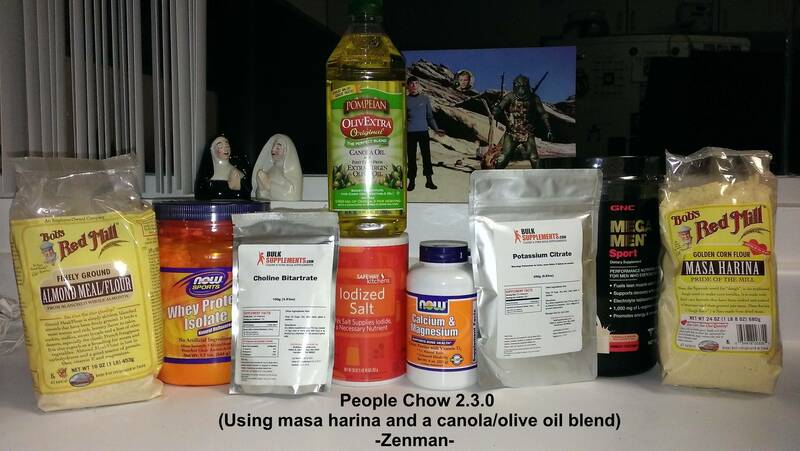 Have you made a batch of People Chow? Send a photo of your creation and I'll post it here! Special thanks to Xander and Zenman for contributing their photos! Also -- if you have a better suggestion for a powdered vitamin supplement or other suggested replacements for making things cheaper please let me know! I've been using this recipe daily as a complete meal replacement for about a year and a half now. No problems to report. Just as healthy as ever. I love the freedom this allows in my life as I never have to deal with preparing or spending time to consume food. I was worried about long-term use, but it seems fine so far. I did a blood test a few months ago - I told my doctor what I was doing and he selected the usual tests + a few others. I am completely in the middle of where I should be for everything. So.... Onward we go!! My first soylent recipe. It's quite bland as a base, tasting mostly of the flour. I flavoured it in a variety of ways including flavoured syrups, peanut butter, iced coffee and hot chocolate. Its pretty good! The taste becomes familiar if not all together pleasent. It's no gourmet dish. The grit takes some fiddling. If you leave this to stand for too long, the husks from the masa flour settle towards the bottom. This can take just a few minutes and is remarkably unpleasant. They stick to the back of your throat when you swallow and you end up making some unhealthy sounding noises trying to get it off. The trick is to add a lot of water and stir vigorously before each mouthful. I'm also fairly sure it gets worse the longer you leave it so drink it fast. I think the husks swell up in the liquid. I gave up trying to mix this in exact quantities and just used a 55g scoop that came with my protein. Two scoops flour, one protein and a roughly eyeballed amount of oil. I swapped out the stupidly expensive fancy protein that was the source of most if the vitamins for some fancy tablets of roughly the same content and used the 2g spoon that came with the choline in each jug. I mixed each meal individually (which I recommend highly, due to the grit) and added more protein than the recipe said as I still felt hungry after just dividing the recipe for a day into three. I added a lot if flavouring to each meal which threw off any remaining calorie tracking I might have been attempting. I replaced 1/3 meals irregularly for 3 weeks till I ran out of masa flour. I am going to try a different recipe next rather than restocking this one. I felt full and alert after drinking. And slightly odd from drinking that much liquid quite so fast. I like the Masa, I'm not having any issues with grittyness. I used a vanilla protein isolate and it is overpowering. This would be good with the addition of some spices. I am new to Soylent. I will say I have been working on one portion of the mix for the last 2.5 hours and haven't drunk 2/3rds of it. Makes a good base recipe to customize to your own needs.